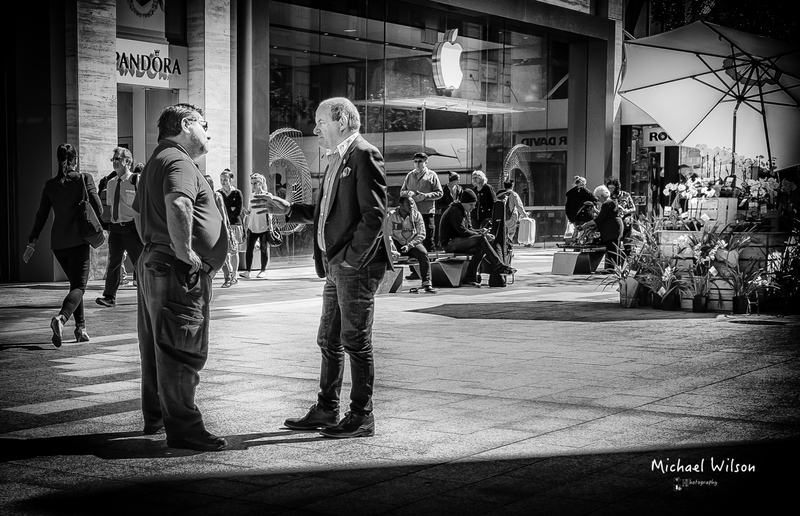 This entry was posted in Photography and tagged Adelaide Street Photography, black & white, Chat, City, Fujifilm x100s, Lightroom, Monochrome, People, Photography, Silver FX Pro, South Australia, Street Photography. Bookmark the permalink. Heading to Adelaide tomorrow and I’m really excited! Interesting how the shadow acts as a frame. Great shot. Compositional rhythms and divisions give balance and integrity to a busy scene. Your use of light and shade, your processing and the vignette, all add up to a fine photo. Thanks for visiting my blog. Without that I would not have found yours. You have a very fine eye for image making and a delicate hand in processing. Wow thank you for that very kind comment. needless o say I am blown away by your photography it is very inspirational. again thank your for your kind words i appreciate it immensely. Inspirational! Well thanks…….but very inconsistent too……all over the place literally and metaphorically!